Can anyone help me? 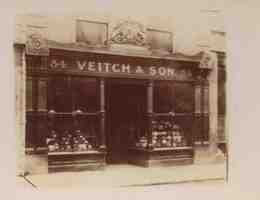 I am trying to find original copies of 19th and 20th century nursery catalogues from the Veitch nurseries: James Veitch & Son in London and Robert Veitch & Son in Exeter. Also any family / business papers that have survived. Have you tried Plant Heritage? They had a Veitch exhibit at Chelsea Flower Show this year. Hampshire Record Office HRO 63M84/175/2 (Heathcote of Hursley) is an Autumn 1854 catalogue of 'Hyacinths and Other Bulbous Roots' imported from Holland and sold by James Veitch jn at the Exotic Nursery, Chelsea.